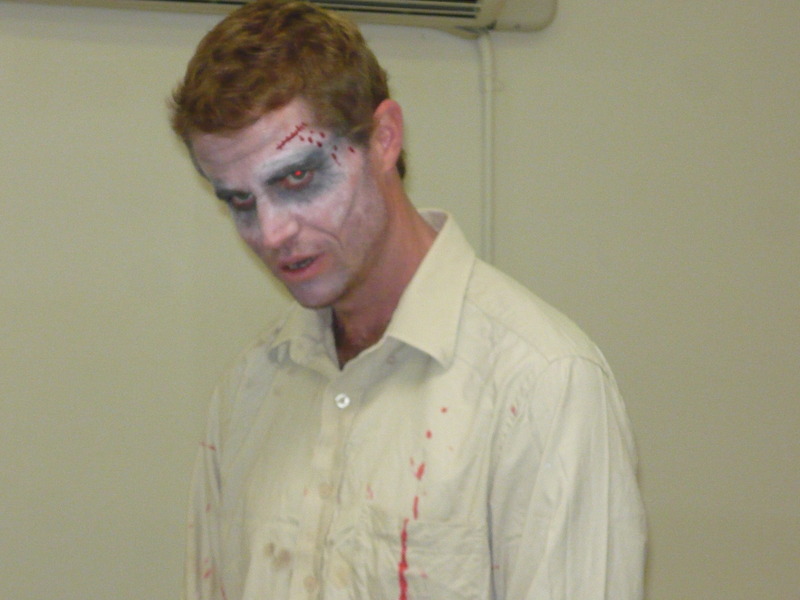 It is the Noosa Triathlon Weekend and Halloween on Sunday! The streets will be buzzing and the people will be celebrating it BIG! If you’re planning on walking the streets to find a job, maybe wait until the start of next week but don’t hesitate calling one of the below advertised positions. Casual Chef/Apprentice – Squid Ink Restaurant. Reliable and efficient person required 4 nights per week. Phone Tony on 0448 623 369 or 5447 4604. Barista – Required for a minimum of 10 hours per week. Only ABN holders need apply. Phone 0421 426 053. Cleaners – Required. Excellent rates. 4-5 days a week. Chemicals supplied. Weekend work. ABN needed, PL insurance and own transport. Please phone Elizabeth on 0413 944 617. Office Cleaner – Weekend work. 15 hours per week. Above award wages. Experience preferred but not essential. Must have own transport and ABN. Cleaners – 5 star accommodation. Must be reliable and hard working with own transport. Immediate start and award wages. Contact John on 0412 222 563. Window Cleaner – Required for Noosa based business. Experience preferred but not essential. Please call 0422 978 765. Teacher Shannon dressed to impress for the Noosa Breast Cancer fun run. FCE 3 class sent an important formal letter to the Director of Studies. Thank you very much for the permission to go to the coffee club with David in our GIL time today. 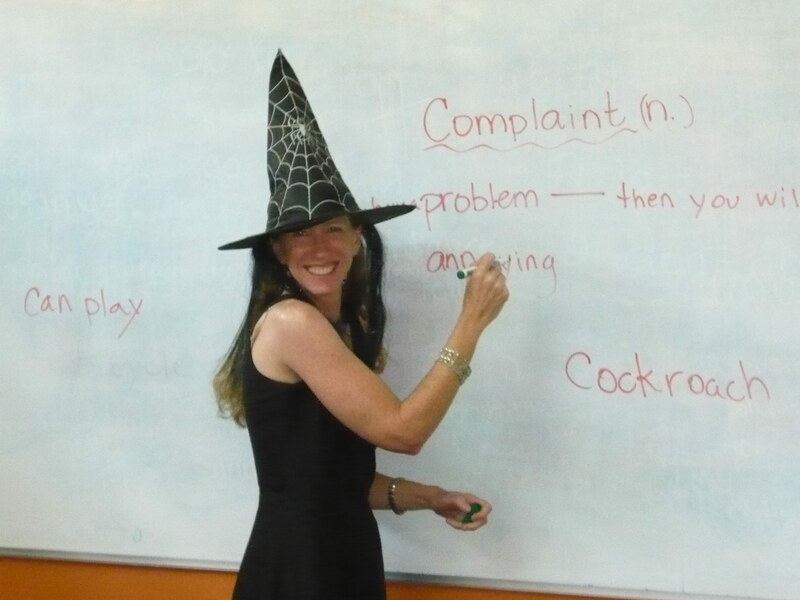 It was a fun way to get more practise at speaking English. We benefited a lot by speaking generally without a specific topic. It would be great to do this once a week, because we think it will be a good exercise for the speaking exam. Having to use graphs and grids and percentages in reports is important for BEC Vantage students. Teacher Phil always puts an interesting spin on the lesson and this week it was using cake and cookies to work out percentages, much to Irene’s delight as you can see below. The students are enjoying the challenges of this Cambridge Business English course. October’s second round of OUT & ABOUT has kicked off to a really good start led by our energetic English teacher, Nathan Katterns. Nathan would like to give a big warm welcome to his new group and congratulate them on their efforts this week. Yesterday the students adventured to the glorious Noosa National Park to cruise the coastal track. It was a beautiful day. After an interesting briefing at the information centre,the students trekked from the Boiling Pot to Dolphin Point learning about the National Park, how it is protected, the animals and plants habituating the natural environment and other trivial information like, Noosa actually means ‘Place of Shade’. 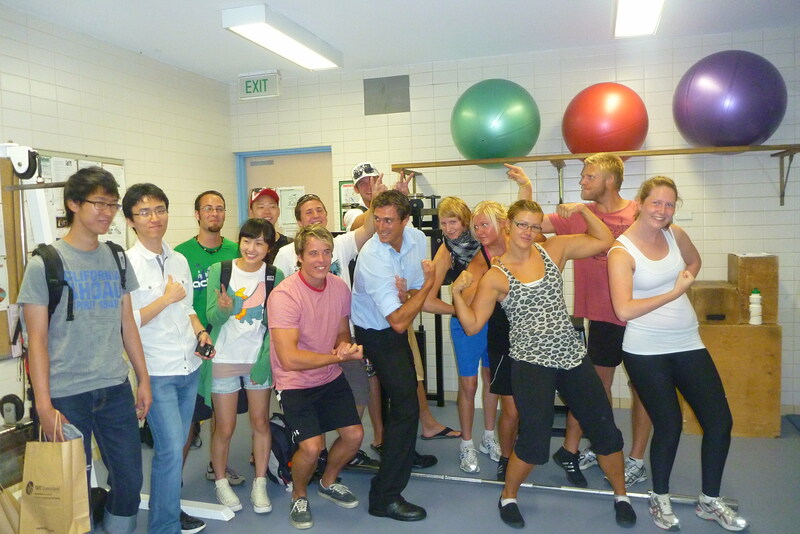 Over the past three weeks students have enjoyed completing GV’s popular exclusive STUDY program ‘OUT & ABOUT’. ‘OUT & ABOUT’ is an alternative fun learning program combining real life learning experiences with English classes in Noosa Australia. Recent program highlights have included Golf, Boating in Noosa River, Mount Coolum Hiking, Tennis, Noosa Surf Life Saving, Master Chef and Social Aussie Barbecues. ‘OUT & ABOUT’ starts again today with a new class of excited students. The ‘OUT & ABOUT’ program allows students to interact with people from the local community to help expand their social and language speaking skills. Congratulations to those students who have just completed their ‘OUT & ABOUT’ program. You worked extremely hard and well together as a team. 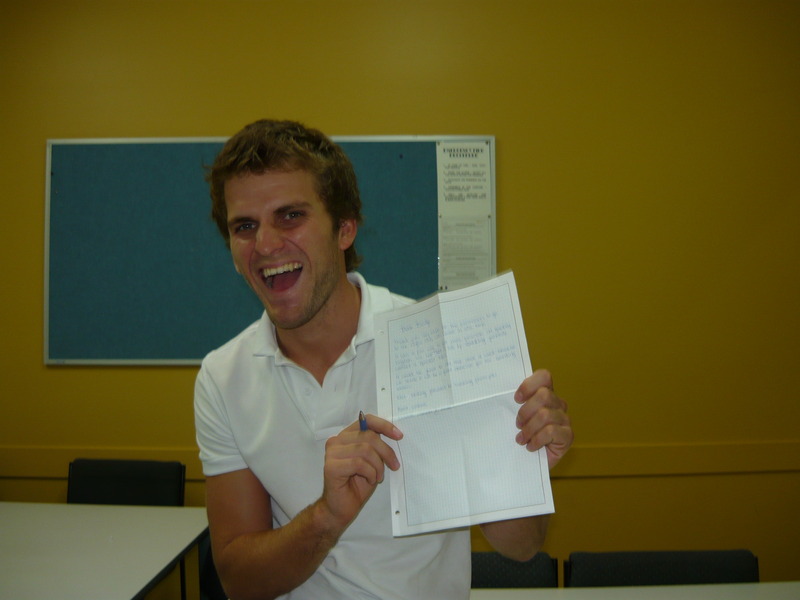 Teacher Nathan had a wonderful time, sharing with you this amazing learning experience. Get your gear on, It’s Halloween this week!!!!!! We are going to party Friday night at GV!!! DJ JORDAN FROM BRAZIL WILL BE THERE WITH SOME RHYTHMIC GROOVES!!! 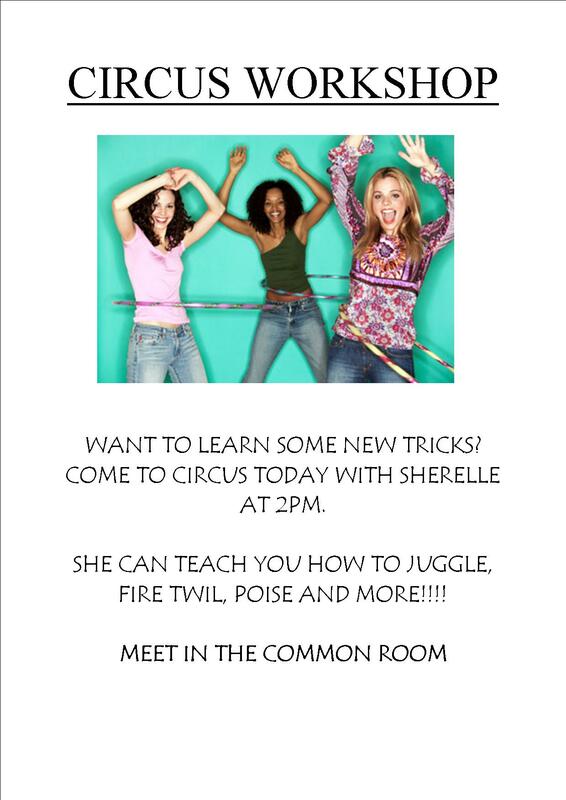 Have you ever wanted to know how to fire twirl, do poise or juggle? 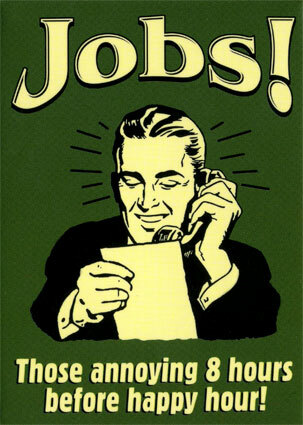 Keep checking the gvnoosablog on Fridays for new job listings. Cleaners – Required for Noosa holiday accommodation. Experience an advantage.. Cleaning chemicals supplied. ABN and PL insurance required. Phone Elizabeth on 0413 944 617. General Maintenance Position – Owners of a residential resort a looking for someone who can join their maintenance team. Hours are negotiable however will potentially involve afternoon/evening work. Excellent working conditions and remuneration. Call Dianne on 0402 562 554. Cleaners – Experience preferred but training will be offered to the right applicant. Must be reliable and have own ABN and transport. Cleaners Wanted – Experienced cleaners required for a resort. Eye for detail applicants. Phone 5474 3299. Mature Person – Required for mowing lawns 2 days a week. Must have clean drivers licence and ABN. Phone 5449 0816. IELTS or Cambridge Exam? Which Should I Choose? Students are always asking me which exam course they should take. 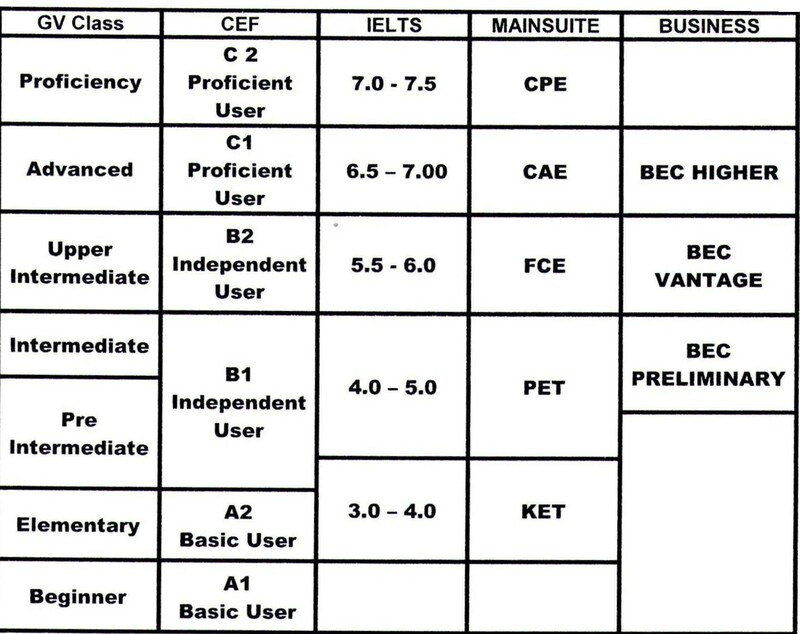 IELTS or Cambridge Mainsuite exams; (KET, PET, FEC, CAE AND CPE). In fact both are Cambridge developed exams although IELTS was developed jointly with the British Council and IDP. The IELTS exam awards a grade according to your level, whereas Cambridge Mainsuite have exams at each level and awards a certificate if you pass. The IELTS grade is only valid for two years whereas the Mainsuite exams have no expiry date. IELTS is used as for immigration purposes and for entrance to higher education such as TAFE colleges and Universities in Australia and overseas. Mainsuite exams are widely used for employment overseas and also for college and university entrance. Mainsuite exams have 5 papers; listening, speaking, reading, writing and use of English. (PET only has four papers as Listening, speaking and reading/writing. 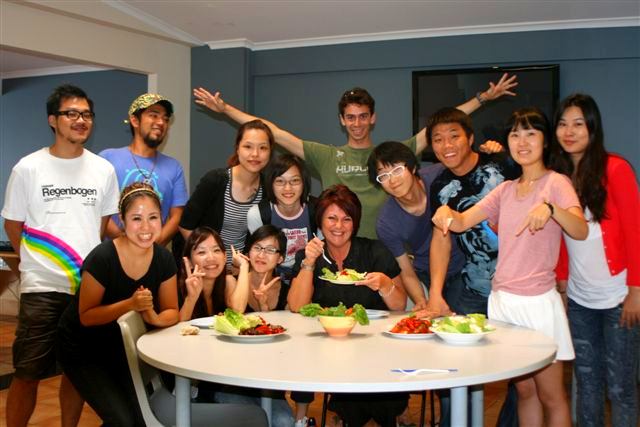 At GV Noosa, we run IELTS continually in 12 week blocks. Students may join at any week, although it is advisable not to join in the last four week block. There is a pre test for entry and students are expected to be at a minimum 4.5 IELTS equivalent level. Exams are held every month in all the major cities. Brisbane is the nearest centre for GV Noosa students. We offer Cambridge PET, FCE, CAE, CPE and BEC exams. These are run three times a year in line with the exams which are held simultaneously around the world in March, June and December. We also offer computer based FCE in August. Entry is by pre test. If you have any questions about these exams or the courses that we offer, come and see Becky, Nina or Lucy. 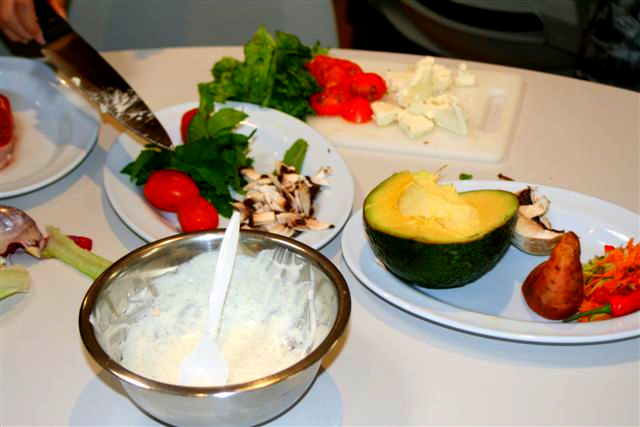 The crew of OUT & ABOUT students whipped up something special in the ‘J’ campus kitchen today. In teams, they had to design a recipe, shop for ingredients, cook, and prepare a well presented, tasty and original dish to impress the tough panel of judges. 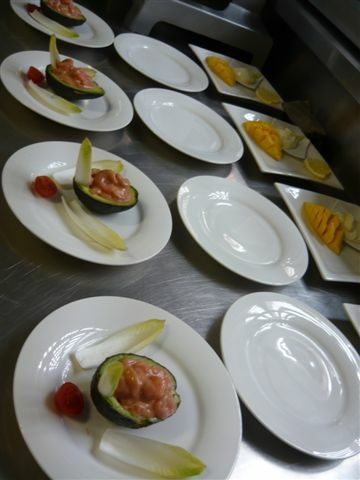 The teams worked hard in the kitchen to become the best OUT & ABOUT GV Master Chefs. There was much chopping, peeling, crumbing, stirring, slicing, dicing, mixing, cutting, boiling, heating and frying going on in the modern kitchen at the ‘J’. The three teams were on fire! The ‘J’ could have been mistaken as one of Noosa’s finest restaurants just by the authentic aroma wafting into the streets arousing the nostrils of people walking past. When Judge Jo, walked into the kitchen she nearly fell over from all the excitement knowing she was going to taste some delicious flavours from globaly produced food. 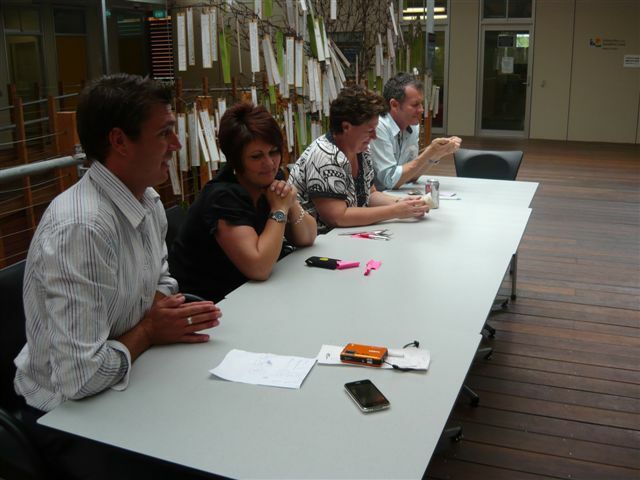 It was no easy feat deciding which team deserved to win this round of OUT & ABOUT Master Chef. The scores were so close but only one team could claim the Master Chef title. A delicious serve of Creamy Brazilian Prawns on Rice, a Korean Pizza with Pineapple and Meringue Dessert and a 3 course trio of Hand Crumbed Chicken Tenderloins pierced with Lemon, Avocado Prawn Cocktail and Lemon Mango Yoghurt were on the menu to tingle the taste buds of our judges. The final results were close and teams 1 and 2 tied on a score of 22 out of 30 but it was team 3 who won OUT & ABOUT Master Chef with a total score of 27 out of 30. Congratulations to all cooks and a BIG Well Done to the winners!!! Here is your chance to experience the most intense adrenaline rush you have ever had!!! 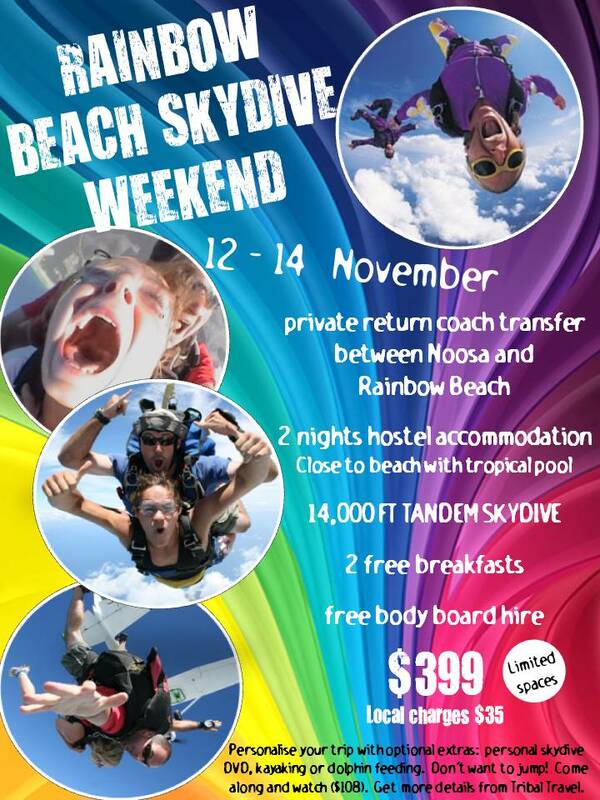 Tribal Travel is offering a Skydive weekend in Rainbow Beach, including transportation, accommodation with breakfast and a 14000 ft tandem jump (landing on the beach!!!!) for only $399*. If you never dared to go by yourself, get a group of friends together and hop aboard this thrilling weekend. Higher Education was the topic this morning and GV students had the opportunity to interact with local students studying at TAFE . They enjoyed visiting the different study areas on the campus and talking to the local students about their study, their career paths and what it is like to be a Sunshine Coast student. Thank you to Katie Johnson and the students for giving us such a warm welcome. For more information on the TAFE college, see Becky or check out the link below. 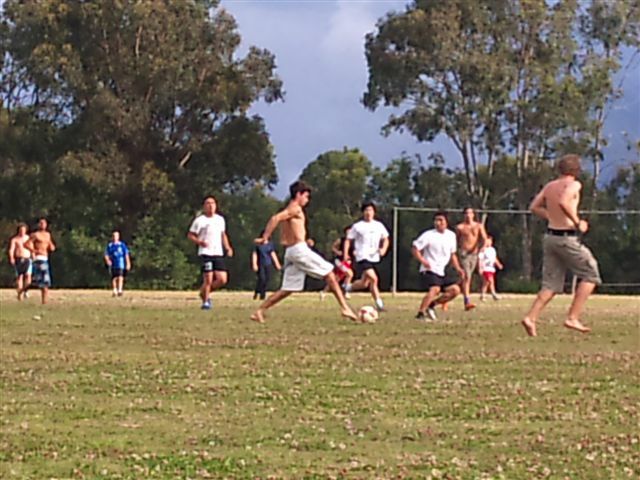 Gv Soccer is so popular at Noosa. 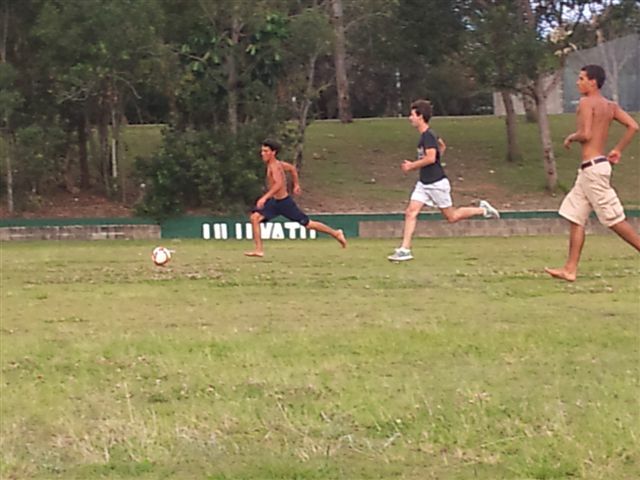 Today 24 sports people showed up to kick the ball at Sunshine Beach State High School. It was No Shirts vs Shirts and the score was one all when activity coordinator Nadia left, she wonders what the score is now? Soccer will be on next week at Sunshine Beach State High School. 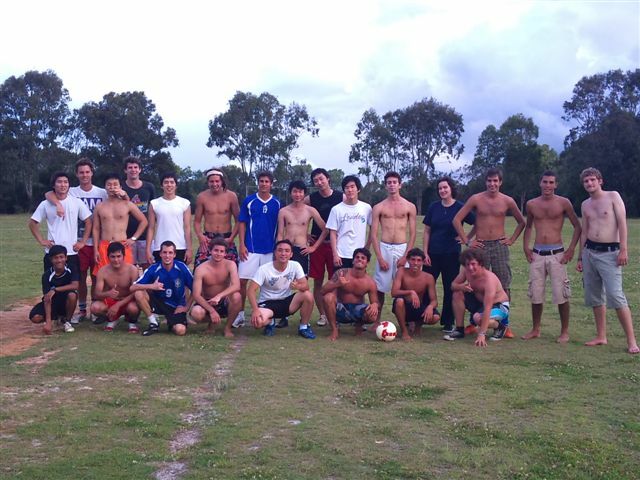 Meet there at 3pm on Wednesday for kick off. If you are interested in playing come and speak to Stam, Guilluame or Nadia. Girls are encouraged to play, otherwise it’s a hot game to come and watch. The aquatic centre is not far away from the soccer field, so if you would like to take a dip in the pool, bring along $3.30, your bathers and a towel. 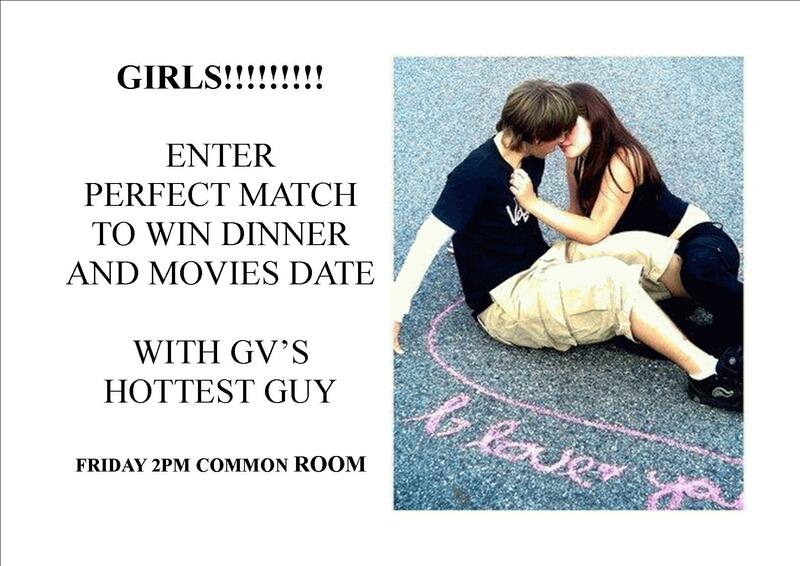 The hottest guy from GV Noosa is up for grabs at Perfect Match this Friday. The girls are lining up to win a romantic date with the Mr Right and Choi from Korea will be playing classical music on the guitar to help set the mood. 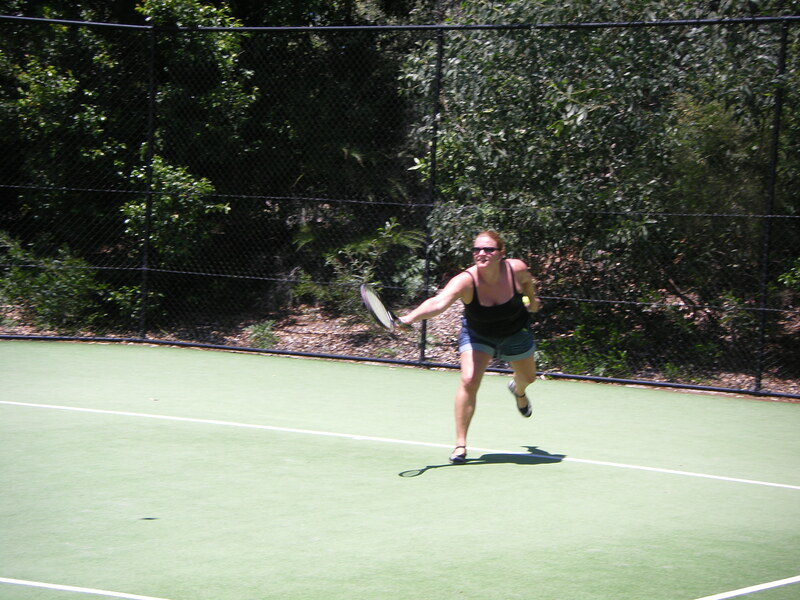 Tennis yesterday, Noosa Library today. 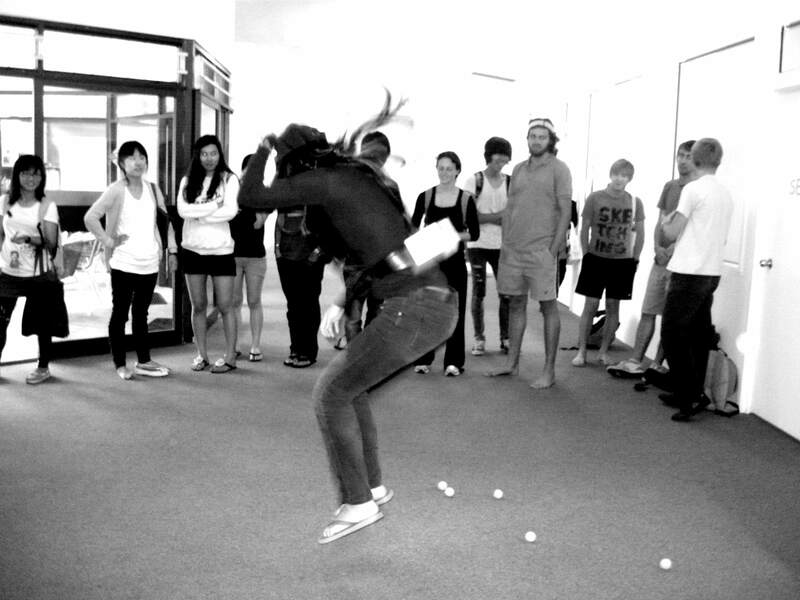 Life for the Out and About students is never boring. 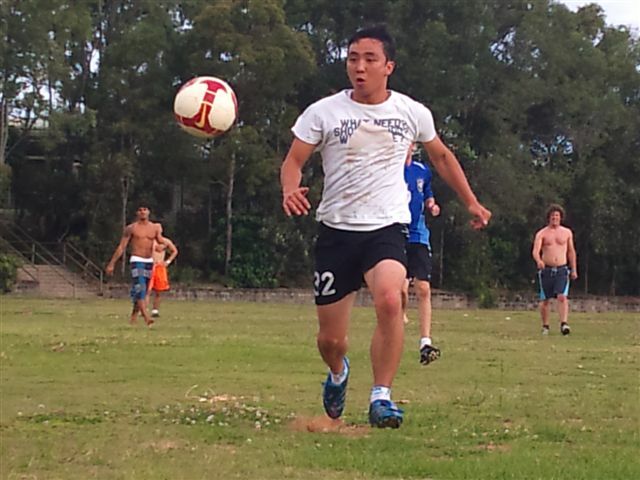 On Monday, the Out and About students visited a sports centre. 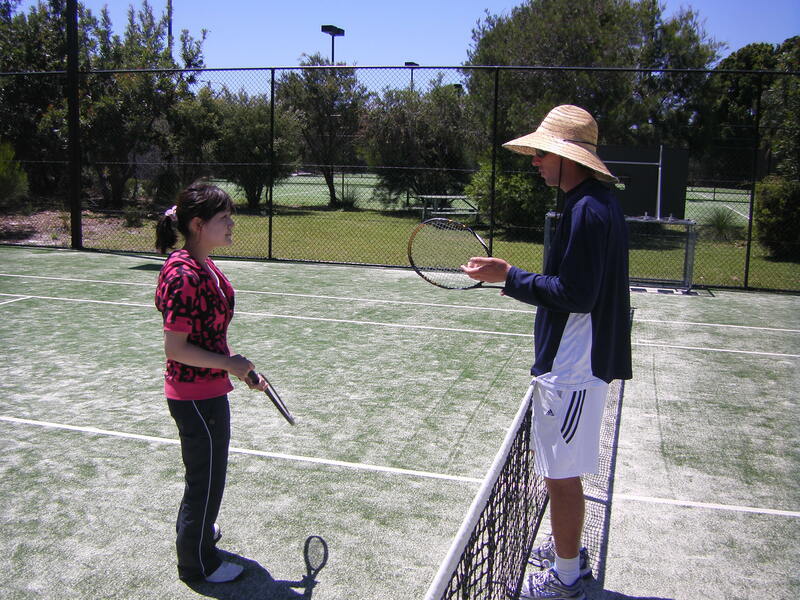 They enjoyed a lesson with a professional tennis coach and practised their ‘sports language’. 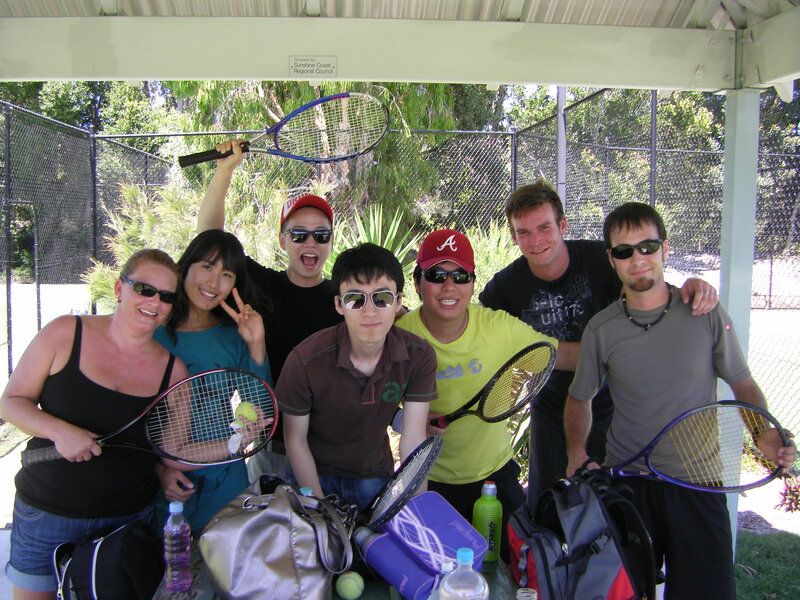 Australians love sport and it is always a major topic around the BBQ, so this is an important topic to know. The sunis shining in Noosa! 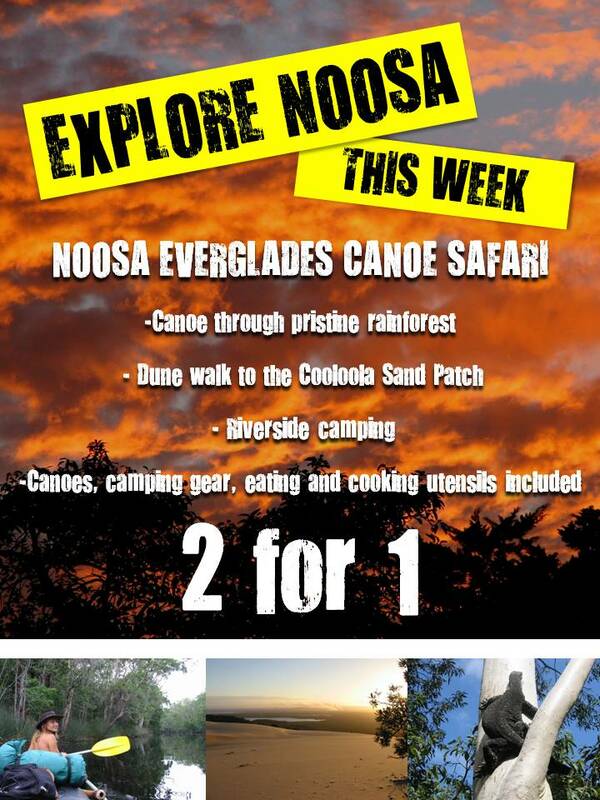 What a great week to explore the Noosa Everglades. Tribal Travel is offering a 2 for 1 for a 2 days and 2 nights canoe safari through the everglades, so get a group of friends together and go into the wild! 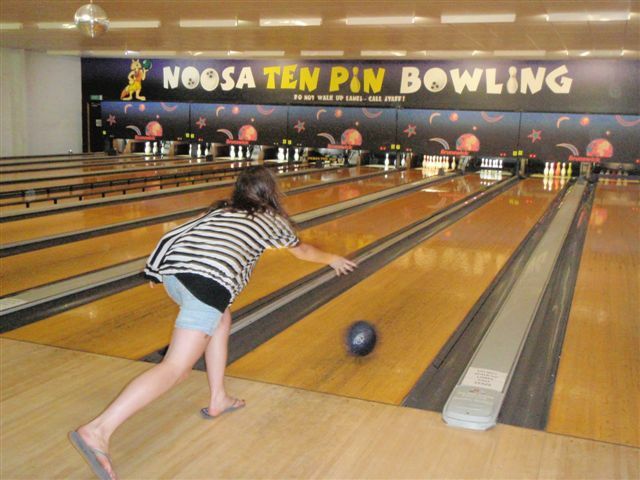 Last week a group of very merry students took a bus trip to the Noosa Ten Pin Bowling Centre. 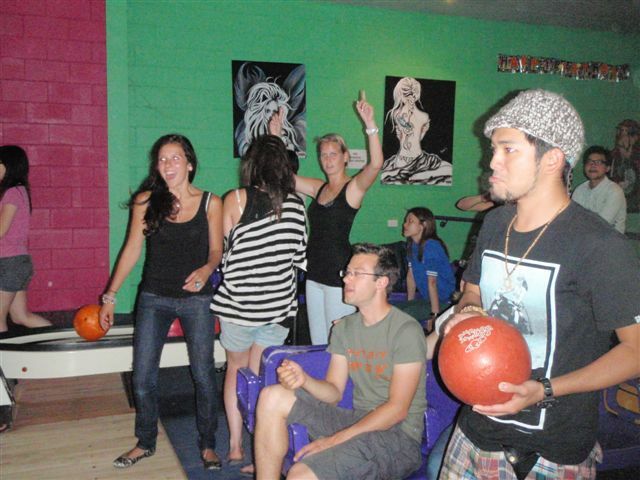 Five teams bowled against each other for a chance to win a free team pass to the movies and a Tribal Travel Hinterland Day Tour prize for the highest score. 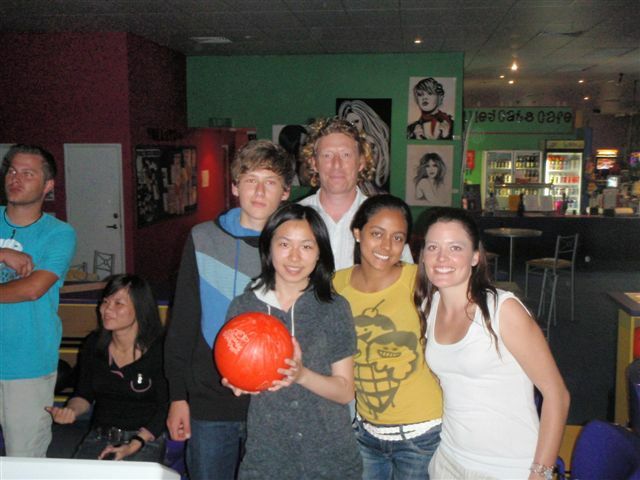 Team after 6 bowls, was our youngest student at the time, Tobias who is only 15. He scored 81, 4 more points than Nina who finished with a total of 77. 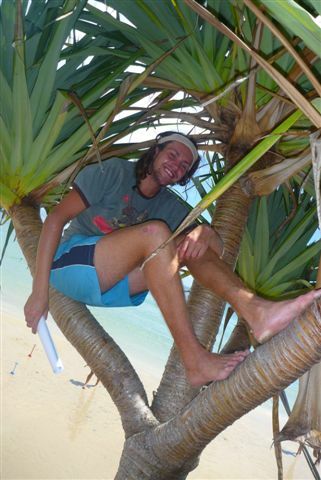 Tobias won himself the Tribal Travel Hinterland Day Tour Prize and had a wonderful weekend. It just goes to show we never stop having fun in Noosa! 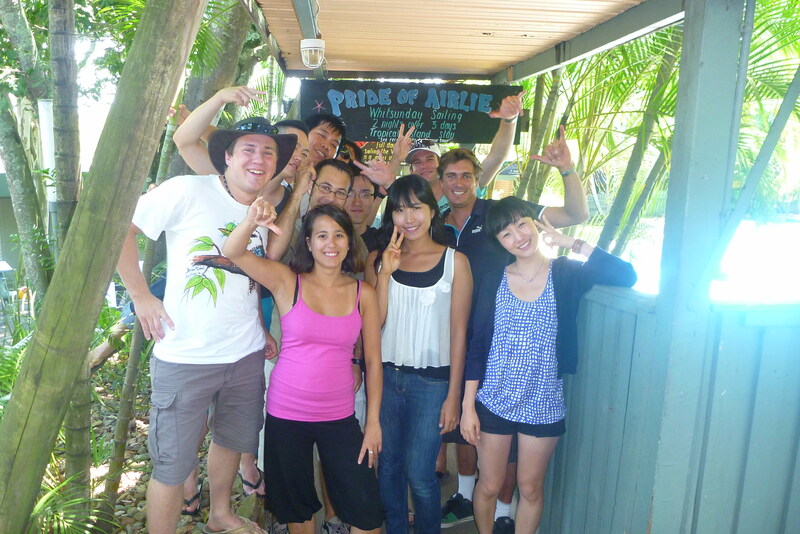 Most of the students at Global Village Noosa are finding work in a very short amount of time. There are jobs popping up all over the place coming into the warmer months and here is a list to help start you off with your job searching. Sushi Rollers – Bar Sushi Noosa. Please give your resume and direct all other enquiries to the managers – Holly and Fabio. Waitstaff Positions – Bar Sushi Noosa. Please give your resume and direct all other enquiries to the managers – Holly and Fabio. Experienced Waitstaff – Blue Angel Restaurant. Immediate start. Great small team environment. Chef/Cook – We are looking for a hard worker who is honest to join Vanilla Cafe in Noosaville. Qualified Chef – Lindoni’s Ristorante Italiano. Award winning restaurant. Waitstaff – Table service experience. Coffee Skills. Weekend work essential. No evenings or splits. Busy Noosa Cafe. Leave a message on 0423 015 716. Cleaners – Experienced. Required for a resort. An eye for detail is important. Catalogue distributors and Collectors – Earn approx $100 to $200 for 10 hours per week. No outlay. Cleaners – Noosa resorts. Great team environment and working conditions. All products and equipment supplied. Flexible hours. 7 days a week. ABN required, easy to acquire. Experience and own vehicle an advantage. Phone Katie: 0421 142 473. 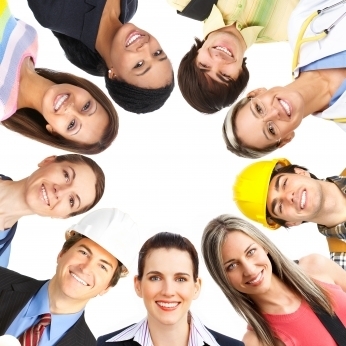 Cleaners – excellent rates and work for the right people. 4-5 days a week. cleaning chemicals supplied. Must work on weekend. Need an ABN, PL insurance and own transport. Phone Elizabeth: 0413 944 617. A favourite study area for our Cambridge classes is the sunny GV Courtyard. Check out the photos below. The Out and About Option students hit Hastings Street today. Noosa’s most popular shopping and eating precinct. The students competed in a quiz which involved getting information from shop keepers, shoppers and members of the public. 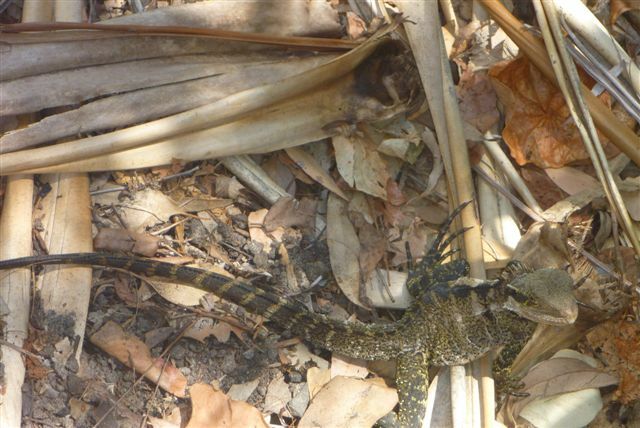 It was interesting to meet the locals and tourists and have fun in the sun in this natural outdoor classroom. Jonny from 7 eleven, is looking for a student to work at the shop on a long-term basis. The applicant will need to be able to work for at least 6 months. Someone who can commit to this time need only apply. Please see Nadia in activities for more details and how to apply. Today, The Out and About Option class visited Tribal Travel and were given the challenge of designing a travel Itinerary. Having spent time practicing the vocabulary and grammar needed for the task, the time had come to sit down with a real life Travel Agent and go through the whole booking procedures. The staff at Tribal Travel were wonderful and gave every student time to spend discussing different travel ideas, talk about costs and arrive at the perfect travel plan. The students were very happy with the opportunity to practice their English in a real life situation and would like to say a big thank you to the patient staff at Tribal Travel and to Sandra their teacher today, for the support and encouragement she gave everyone. Everybody knows that at 2pm Monday, Wednesday and Friday, Nadia has a wild, wacky and wonderful activity schedule to enjoy good times with your friends. Last week was off to a good start with a didgeridoo demonstration from local artist, Scott. 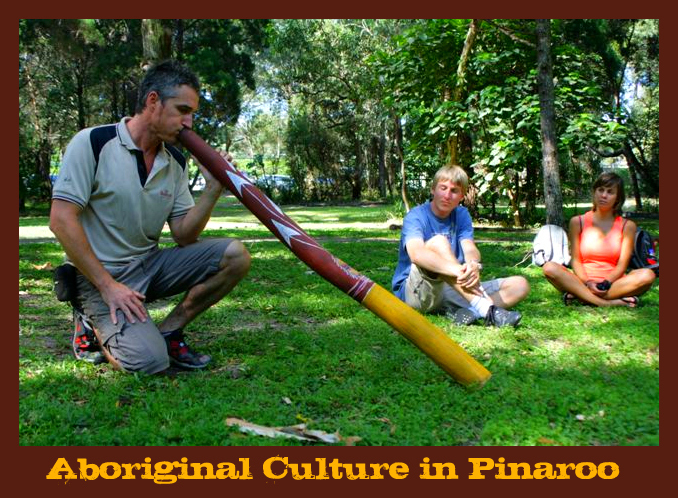 Scott gathered with the students in Pinaroo Park to share the spirit of Aboriginal music. 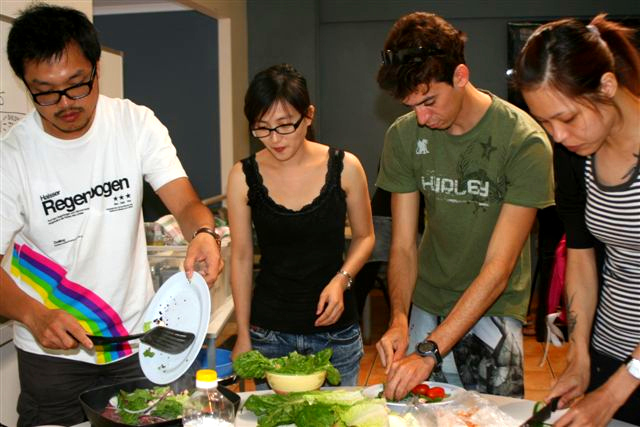 Team Japan, Team Korea and Team Taiwan competed against each other in a round of Master Chef mid-week. 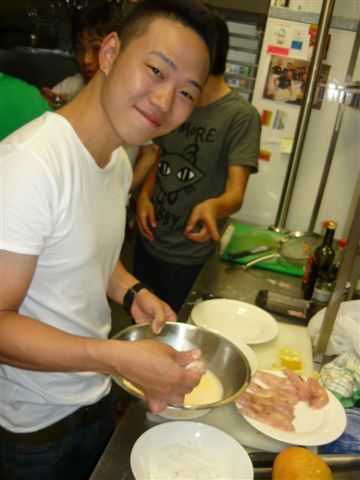 The three teams were given a variety of ingredients to create a signature meal which Homestay officer Jo had the pleasure of doing the taste testing and pick out a winning team. 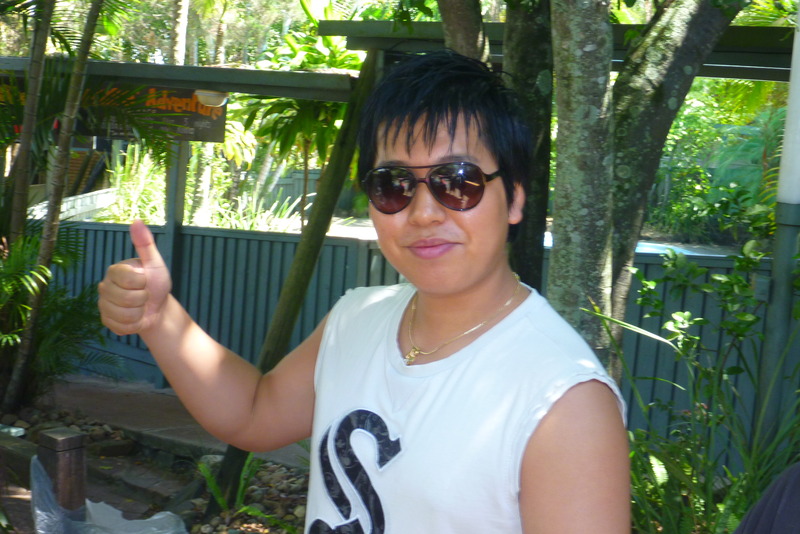 Team Japan won the Master Chef and received a free tour to Underwater World at Mooloolaba, courtesy of Tribal Travel. 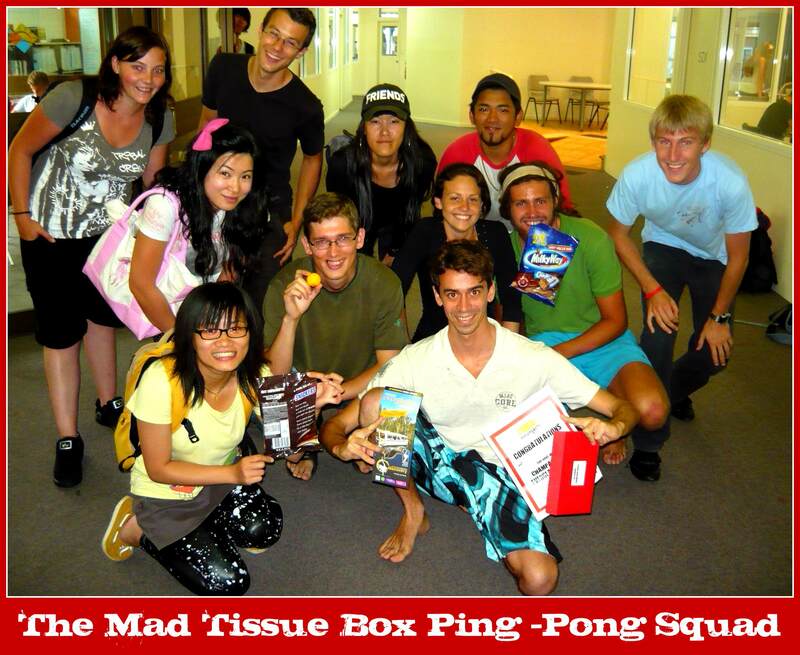 Who would have thought a tissue box tied to a belt with 10 ping-pong balls in it, could be so much fun for GV Noosa students. 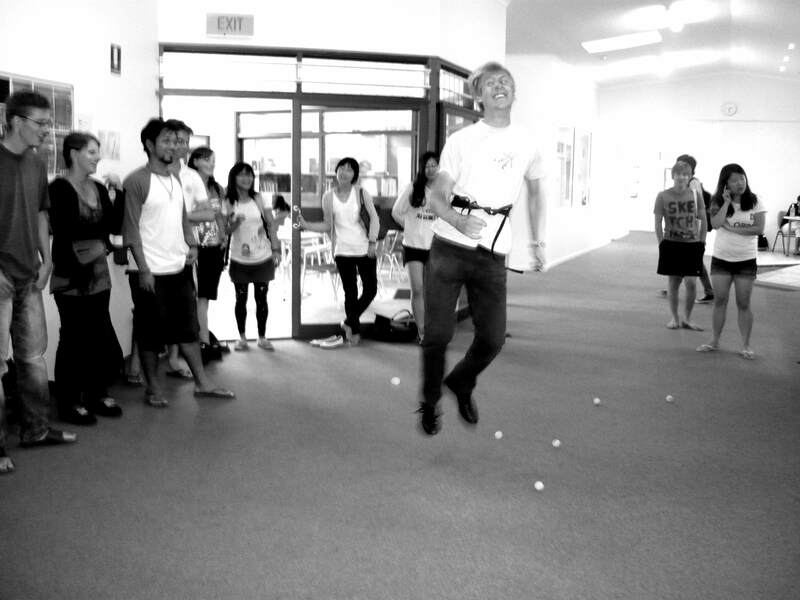 ‘Minute to Win It’ always poses a hilarious challenge that students just can’t seem to get enough of. 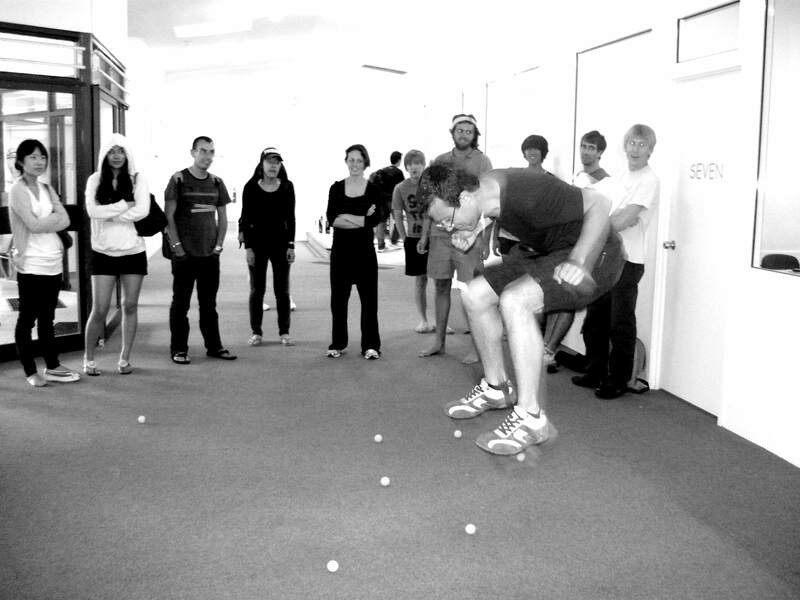 The aim of the game was to empty the tissue box full of ping-pong balls in 60 seconds. Sounds easy, but it’s not so easy when the tissue box is tied to your back and the bodily and facial expressions are to die for! 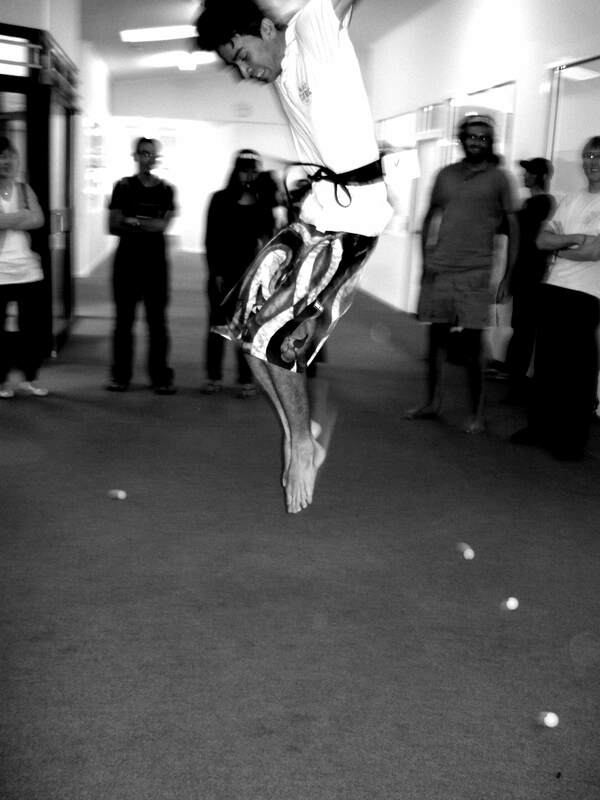 Thiago from Brazil was hard to beat, completing the tissue task in the fastest time at 3:44 secs. Thiago won an Everglades Champagne Afternoon Cruise, valued at $75, courtesy of Tribal Travel. If you like what you see in these pictures and you are studying full-time, come and join in on and get to know how much fun and clever your peer students are. WOW! 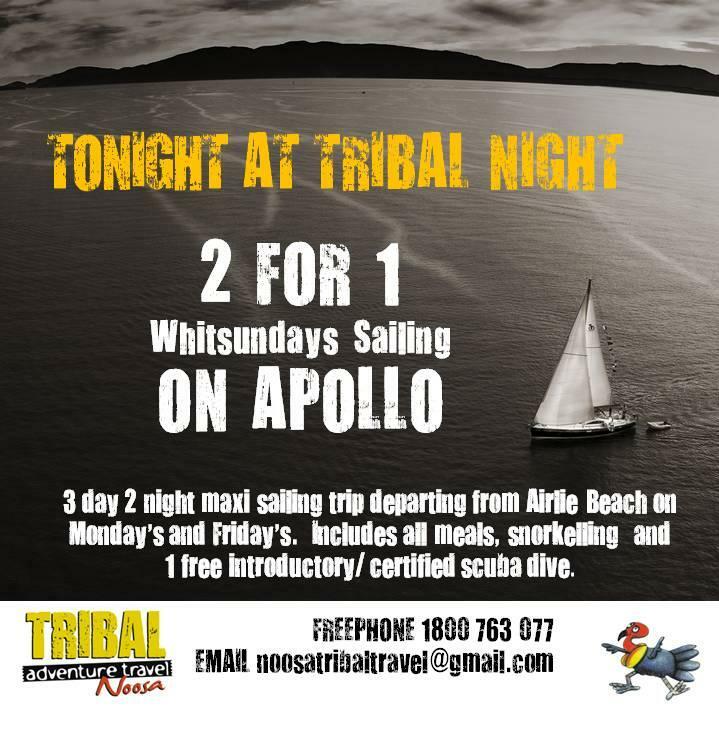 2for1 on the Apollo! Today we would like to welcome our new students from Switzerland, Belgium, Taiwan, Germany, Japan, Italy, Korea and France. We hope you enjoy your study and life in Noosa! An important part of social ‘chit chat’ is recounting an anecdote. 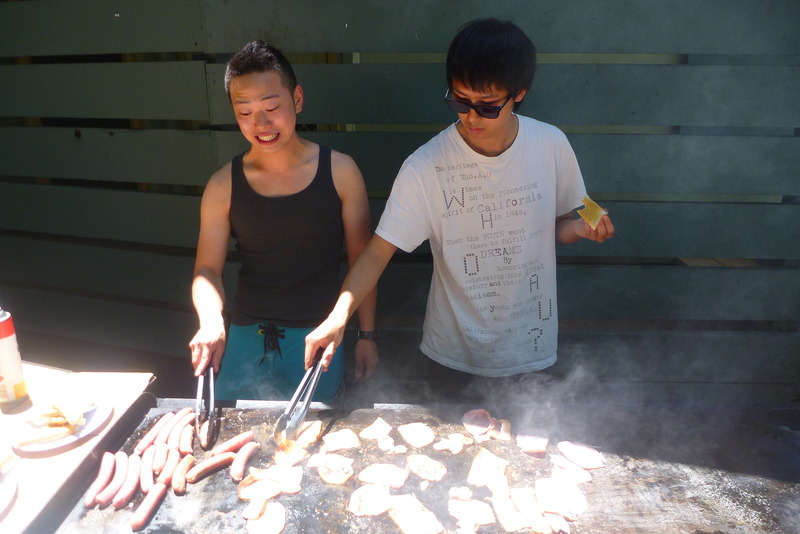 This is what the Out and About students practiced today, around a traditional Australian BBQ. Teacher Nathan Katterns, taught the students the grammar and structure needed to be able to tell someone about something you have done or something that has happened to you. 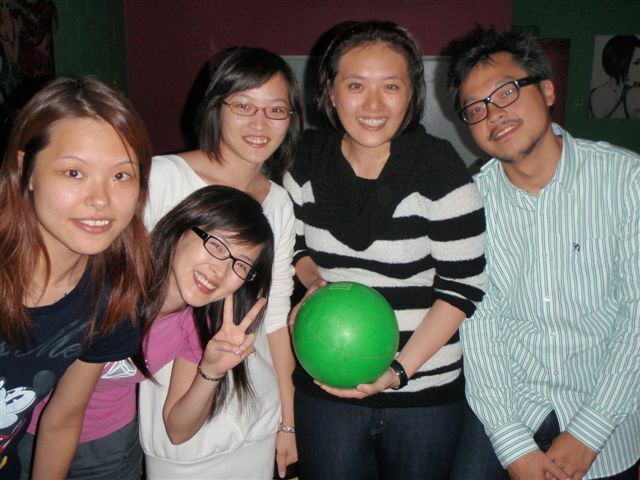 Everyone enjoyed listening to amusing personal stories from around the globe and felt that the opportunity to practise their English in a relaxed setting helped improve confidence. It was a perfect end to the week. 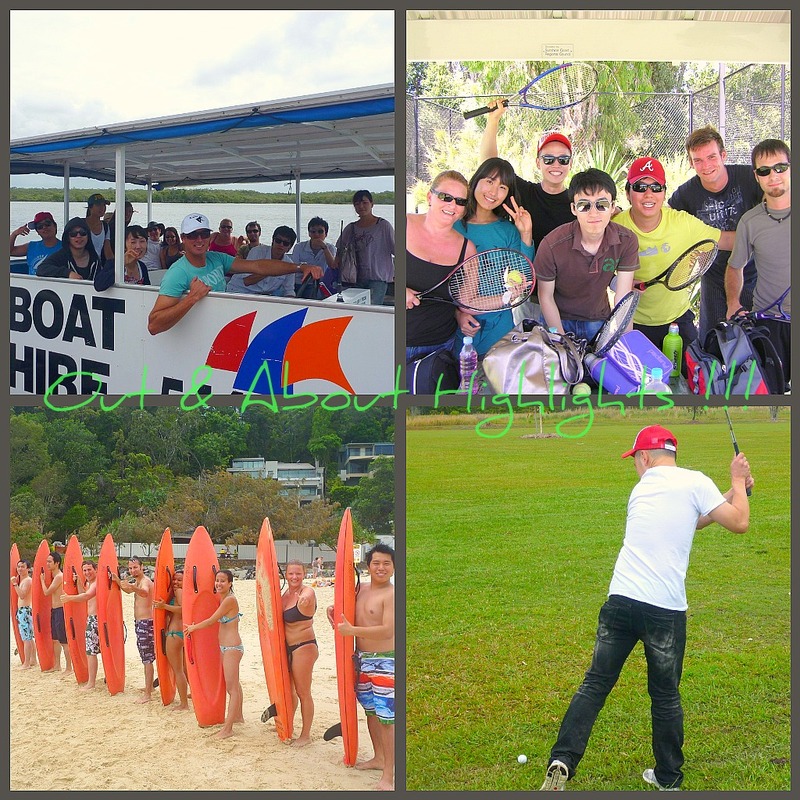 Everyone is looking forward to next week’s activities which include; The language of travel and traveling, a morning on a golf course to talk about the international language of sports and a cruise down the beautiful Noosa river to learn everything you need to be able to talk about the landscape around you. Working in Noosa can be easy if you’re prepared with a resume, bright personality and positive attitude. Chef 3rd Year Apprentice – Hastings Street. Great workplace. Immediate start. Call 0418 700 845. Cleaners Wanted – Halse Lodge Backpackers. Part time. Flexible hours. Great working conditions. Phone Drew on 5447 3377. Qualified chef Rococo Noosa. Beachfront location Hastings Street. Immediate start. Phone Lance on 0420 660 571. Expert in Word Publishing – required for online investment research business located in Noosa. Permanent part-time position. Work from home as long as you have the internet. 5-10 hours per week. Cleaners – Noosa areas. Get paid while you work. Phone: 0401 477 575. 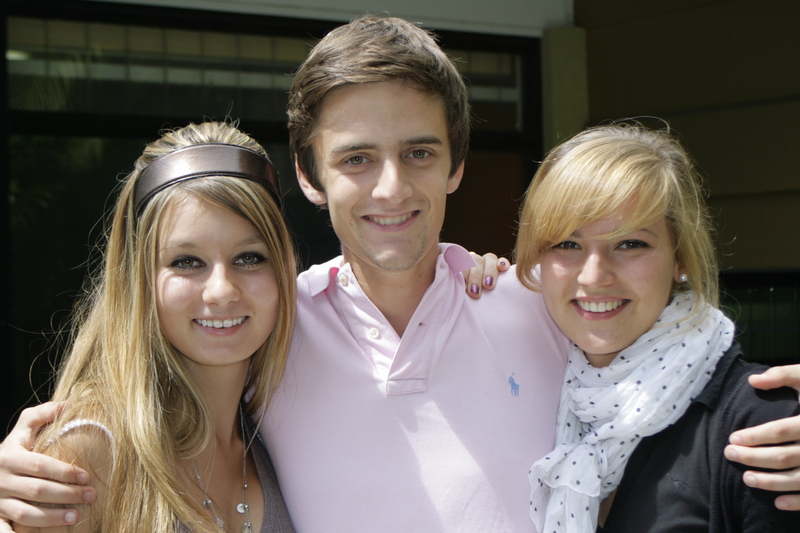 This week we interviewed French students Alban, Aurelia and Laura to ask them how their Aussie study experience is going? 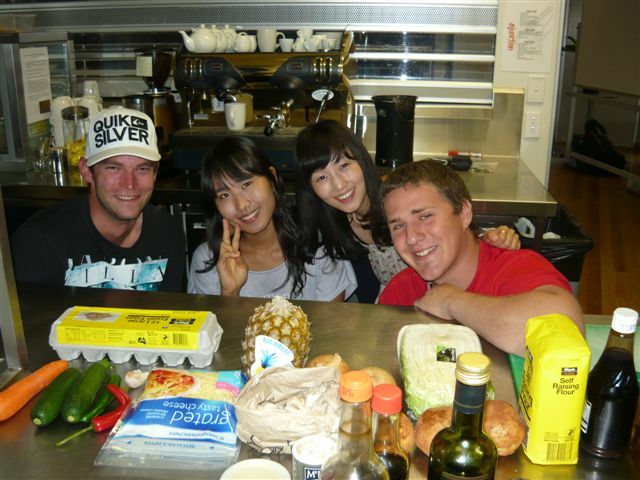 Why are you studying at Global Village Noosa? Alban: Firstly I live in the big city and I think that’s its best to study in a small town. It’s very peaceful with beautiful beaches here in Noosa. I am also here to study English. I took an exam for the French Air Force and I failed, so now I am here to improve my English and then take another exam for the French Navy. Aurelia: I wanted to improve my English to help study at University. I have done one year at University in France studying English and Chinese, and I need to improve my English to do a higher level. 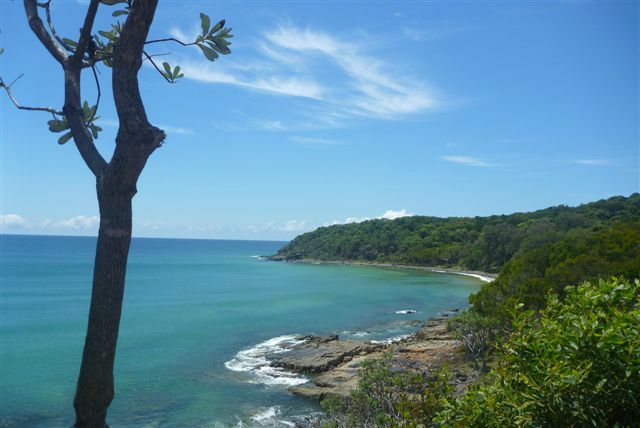 Laura: I am studying at GV Noosa because I don’t like a big city and it is calm here. I think it’s important to improve my English for my future and employment reasons. I would like to pass the Cambridge Exam because I think it is very good for my CV. 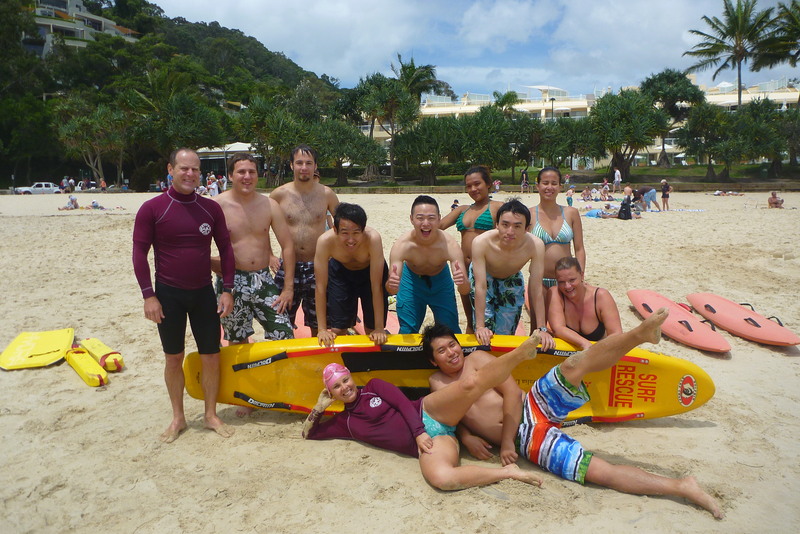 What do you enjoy most while studying in Noosa? 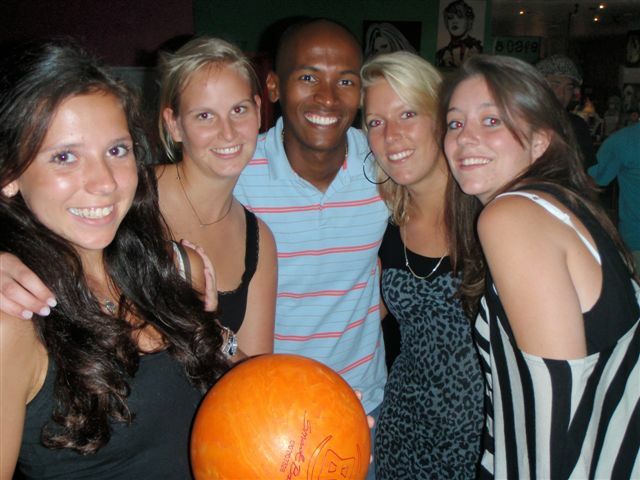 Alban: I am enjoying the Monday nights at Tribal Night the best because after school we go to the beach and it’s cool to meet other friends afterwards in the bar to drink some beers and party. Aurelia: I thought Noosa was perfect because it’s not too big and not too small. There are a lot of activities organized by the school. The price, the beaches and the people is a lot better than studying in England. It’s half price for example. Financially, I could stay longer in Noosa than England. Laura: I am really enjoying going to the beach, it’s very relaxing. My host family is very cool too. 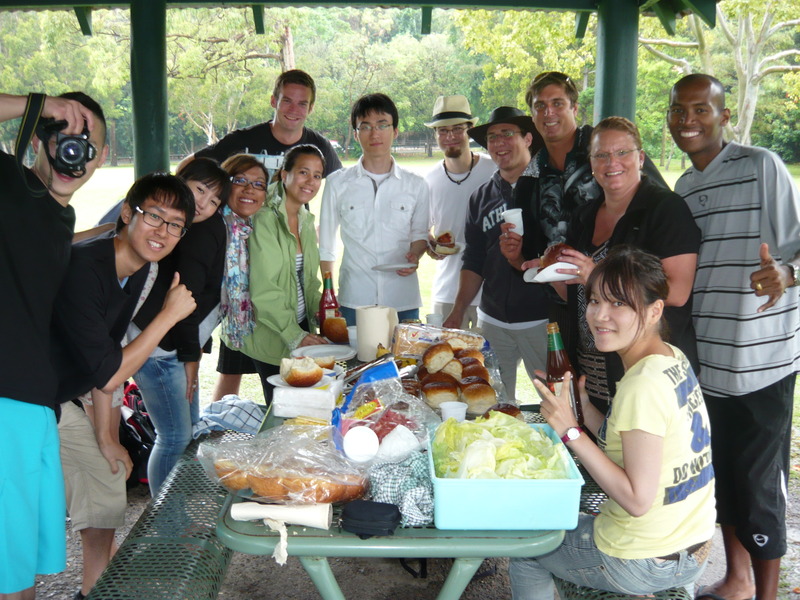 The barbecue is great too, that’s where I like to meet my friends. Tell us about your course and study experience? Alban: I am in the PTE courses, so I don’t have the pressures of other courses. I have an exam but it’s not as hard as the advanced courses. It is fun and I love the pedagogy. In France we have very bad pedagogy for the English language. Swedish are very good at languages but French aren’t so good. The French teachers don’t use a lot of strategy in English teaching so I think it’s better to learn English here in Australia. 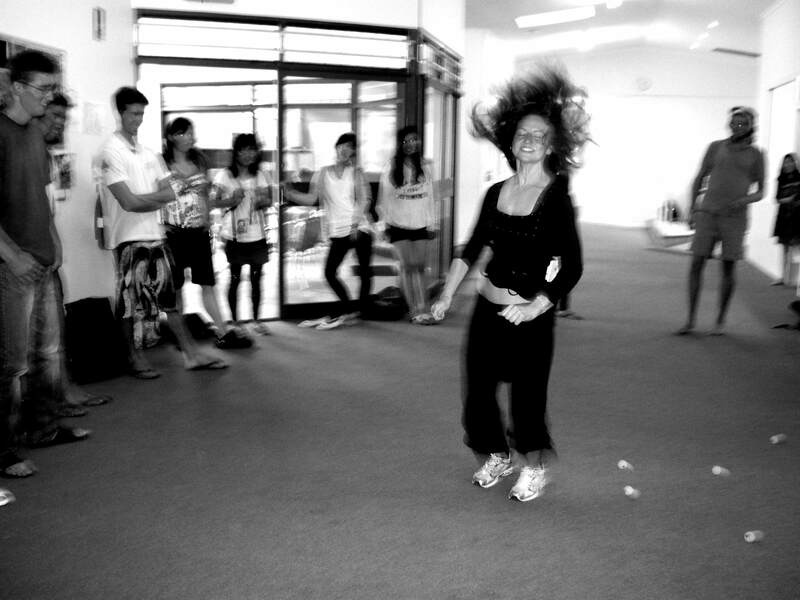 Aurelia: I really enjoy the courses because the teachers are funny and they know how to make learning interesting. The lessons are very interesting because of the way we learn and how the teachers teach us. Laura: The teachers are really good, they are always funny and they play games. I think that is a good way to learn English because it’s not boring. 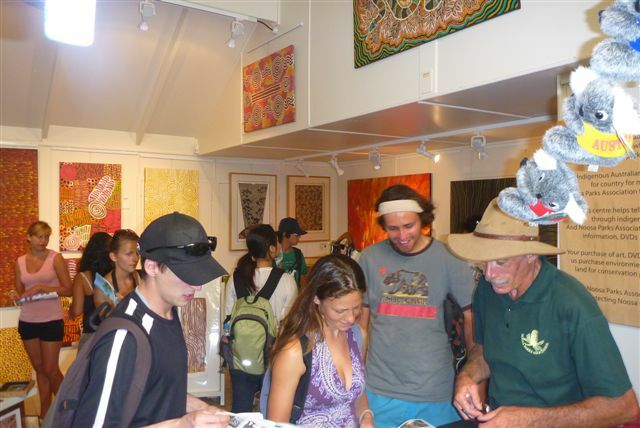 How did you hear about Global Village Noosa? Alban: A friend was here one year ago and that is how I heard about GV Noosa. Aurelia: My friend was here six months ago and said it was good and recommended for me to come here so that is also why I made the agreement with my agency. Laura: I was searching for learning English in different countries and I found ESL on the internet and I saw Noosa and liked the pictures and the description of the area. Also, the beaches were near the school and that appealed to me. I didn’t want to go to the big city and Noosa seemed to be quiet and calm, that’s why I chose Noosa. Now that I am here, I can see that it’s what I expected and I am having a good time. 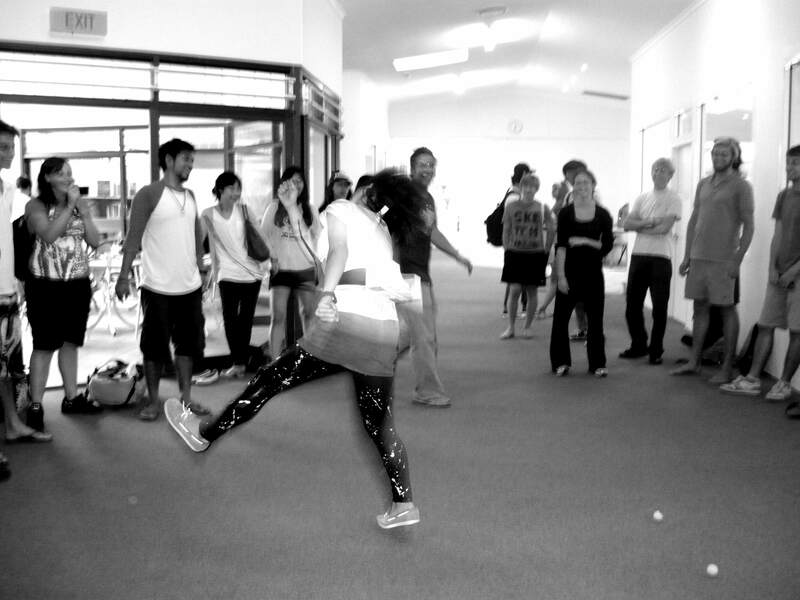 Why not make your Australian experience the real deal by introducing yourself towards Aboriginal culture and learn to play the instrument known as the didjeridu? Scott from Bushlab will be running a 3 week workshop at GV Noosa to teach you the foundations of learning to play this very unique instrument focusing on circular breathing techniques. Playing the didjeridu can increase your health and it is the perfect way to centre yourself and become one with the earth. 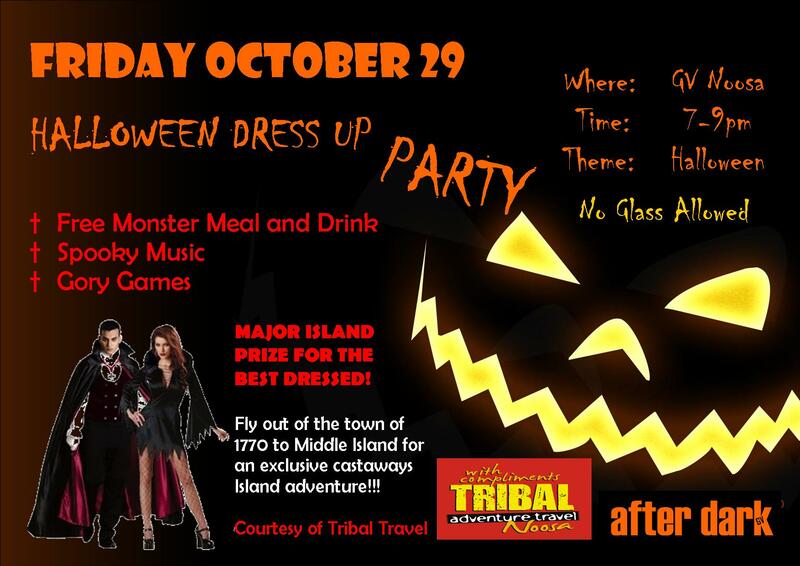 Please see Nadia at activities to make a reservation. 10 people are required for the course to run.